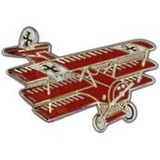 This German Fokker Tri-Plane Pin is perfect for any hat, jacket, bag or anywhere else you want to display this awesome pin. Measures approx. 1 5/8".